As a pastor, I see myself as a triage nurse for marriages. My office is often the Emergency Room for couples who worry they might have a relationship-threatening condition. I am not a counselor. I do not do marriage counseling. I can evaluate the situation and recommend the proper course of action. Some people worry they are seriously ill, but I have the ability to reassure them they are on the right track. Problems which seem unique to one person can actually be universal to every couple. I can assess and send them home with no treatment. Other people worry they are seriously ill, and they are. The affair is revealed; the addiction surfaces; years of ignoring the relationship becomes evident. I assess and refer to a professional. If you answer “yes” to any of the following questions, I would highly recommend consulting a marriage counselor. 1. Do you worry your marriage is headed in the wrong direction? 2. Is there a significant secret which you have not told your spouse? 3. Do you feel disrespected by your spouse? 4. Are you unable to discuss your concerns or feelings? 5. 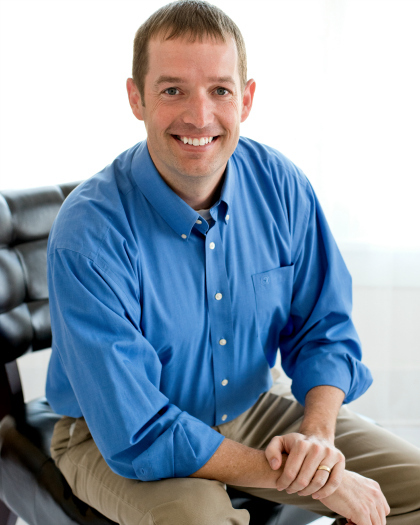 Is there a destructive behavior by you or your spouse which could destroy your relationship? 6. Do you feel there is an aspect of you or your spouse’s life which you do not share? 7. Is there an unusual new stressor in your marriage (i.e. grief, child with special needs, sickness, etc)? 8. Is there a significant issue to which you cannot find a workable solution? 9. Do you sense you and your spouse are growing apart or living parallel lives? 10. Does either partner ever get emotionally or physically out of control? 11. Do you find yourself thinking regularly about someone else? 12. Do you experience the same conflict over and over without resolution? 13. Do you think with some effort your marriage could be better? Answering “yes” to any of the above questions is not a sign your marriage is irreparable. Answering “yes” to any of the questions and ignoring your answer, refusing to get help is a sign of great danger. Any of the issues listed above can bring down a marriage if the couple foolishly refuses to do the work necessary. Any of the issues listed above can be resolved if a couple wisely recognizes the danger and willfully does what is necessary to heal. Whenever we face problems in marriage, the easy thing to do, the popular thing to do, is to do nothing. That is the wide gate. It’s easy to ignore issues in hopes they will go way. However, ignoring something is easy now, but it will be more difficult later. Humbling ourselves, seeking help, exploring the fault lines in our relationships is a difficult process, few choose it. Yet if we do the hard work now, it will lead to better relationships and an easier life. What is hard now becomes easy. What is easy now becomes hard. Read the questions. Discuss them with your spouse. Do the work necessary to have a healthy marriage. If you could add a 14th question, what would it be? I agree completely. There is a huge age gap between my husband and i, sometimes I think that’s where most of our problems come from. Halve the problem is also that he haven’t got a full time job. Is there any where I can go for counseling where it won’t cost me a fortune. Counseling is expensive and we are barely coming through. Ronel, where do you live? If you are nearby, I have several options for you. Is there any point if I answered yes to them all!! Yes. There is a point. 14th question do you really love each other? We have had counselling on and off. We eloped because my family would not consider him available for marriage because he was divorced. I used to be very close to my immediate family and now they will hardly speak to me. We are both Christians but I have had a rough few years really believing that I am saved, my Dad told me that I would go to hell if I married my husband. His argument is that I am committing adultery because (even though he is divorced) he is not eligible to remarry so our marriage is not real in front of God and according to Scriptures, adulterers go to hell. It was very hard for me since I come from a Reformed background which always taught that we cannot lose our salvation. My husband and i have been married for 20 years. I have felt our life drifting apart from each other but we are very active with our kids. We haven’t been intimate in 5 to 6 years. I thought it was due to back injury and his diabetes meds and performance issues. He showed me he loved me in little thoughtful ways. But he told he last weekend over the phone that he doesn’t love me anymore. Since he’s been home he had acted like nothing was said. Where do I go from here? How can I stay in a marriage that is loveless and passionless? We are catholic. ..surely they don’t think its best to stay in a loveless marriage? Martiza, I would call a counselor, make an appointment, and invite your husband to go with you. But I would go with or without him. I think a good 14th question would be “Do you feel comfortable being yourself around your spouse?” I believe trying to control each other is a big issue in marriages today. In a relationship the individuals actions can directly reflect back on the other often causing embarrassment or conflict. Or jealousy/possessiveness can cause one partner to feel they they can’t relax in mixed company for fear of causing conflict. Of course there are underlying reasons and circumstances at the root of all these fears but it may be a good question to bring those root causes to the surface. They must be dealt with in order to bring peace. Lori’s question #14 is an excellent add. Another issue to address is explosive behavior. How can I possibly attend marriage counseling with a man who explodes and punishes me when I say something he doesn’t like? Unless I behave exactly the way he wants, he explodes and punishes. He goes where he wants, does what he wants, spends what he wants. He especially says whatever he wants in whatever tone he wants and when it is an unleashing and using me as a whipping post, his response is it is just talk and I need to let it roll off. If I say I don’t like something, he tells me I am too demanding and if I say it wrong, after being forced to keep it in for months, he tells me it is all about the presentation and takes the stance that because I didn’t approach it in the manner he expected, my feelings are invalid. Then comes more punishment. As long as my benefits him; I am expected to love on him, and cuddle, and kiss and hug and be affectionate when he screams at me; spends our money, lies, puts his mother first, on and on, and if I am hurt by his behavior then I am in trouble and punished. The punishment can come in the form of more lies, more spending, intentionally breaking an agreement, insults, threatening, on and on. So, how can marriage counseling possibly work? In the past, I have gone to counseling with him, and we have met with our church leaders. If I say in the room that something is bothering me, then when we get home, he unleashes. We’re divorcing now, and I’m feeling guilty. I came home from a weekend camping with my daughter (age 19), and found that my son (age 22) had pulled out photos of him when he was a baby, photos of our family when he was young and we were all together, and even photos of my wife and me before he was born. It appears that he misses his mother, who he’s seen only twice for a few days at a time since she left me and moved back in with her mother, brother and sister 4 hours away a year ago (she won’t visit the kids). I asked my wife to go to marriage counseling almost three years before she left, and she refused. From reading one of the related articles, I guess I did it the wrong way. Rather than tell her that I wanted to stay together and that I loved her, I told her that I was avoiding her, and that I thought we needed counseling. My wife leaving has really hurt the kids, who had been hurt repeatedly beforehand. Looking back to when I first asked her to go to counseling, here are my answers to the 13 questions at that time. Yes. I’m avoiding my wife, and worried that anything I say will get me yelled at, especially if it’s about our daughter, who died three months before. Me, no. No secrets on her end, either. Yes. I ran my daughter’s funeral and got blown up about every detail, ranging from simply telling her what the police, the funeral director and the medical examiner said to asking her mother if she got a good night’s sleep. I also got criticized for going out to look at the progress of the flood repairs (we got hit with a flood a month after our daughter died), in part to talk to our neighbors and break the tedium and in part because it was nice to see something getting back to something approaching normal again (we had no roads or bridges after the flood). My wife told me I was watching because I had to have control; not sure why she came up with thta, or why me spending 15 to 30 minutes a day outside bothered her. Yes. At that time, I felt like anything could trigger a negative blast, a critique, or anger. If I suggested something, such as her calling to get disaster unemployment, provided by FEMA during emergencies, and she said no, I didn’t argue, and instead did it myself. Mentioning my daughter’s name could trigger anger. Yes. Both of us. My wife came across to me as negative and witholding her feelings (looking back, it was deep depression), and I was not only withdrawing from her for protection, but not in the best spirits myself. Many areas, and the gap widened at that point. The death of our daughter followed by a flood. I fear her; I feel abandoned and that she hates me. She probably feels abandoned as well. I was concentrating on survival – trying to work, rebuilding from the flood, taking care of my daughter’s affairs, trying to work, and feeling this huge loss which I was unable to share with my wife, because she wouldn’t talk about our daughter. She was holding her emotions in. Physically, no. Emotionally, the story has probably been told. Me, no. If she was, it was about her family four hours away. Not sure. Perhaps it was already too late by that time. My wife’s refusal to go to marriage counseling just made me withdraw further. My recommendation: get help early. Don’t make it your spouse’s fault when you ask. Watch out for resentment, even if tough times. Dos anyone see my resentment in the comments above? Your children will really hurt if you divorce. And you might actually miss your spouse (I miss my wife sometimes, but rarely miss the one who was there after my daughter died; how much of that was because my view was twisted by my own filter?). And for those who think their kids have grown when they enter college, they haven’t, whether they’re still living with you and commuting (as one of mine is) or away at college. College kids are still kids. And parenting lasts a lifetime. Oscar, Thank you for your thoughtful words. I’m sorry for your pain. I hope others read your response and have the courage to get help. I applaud your courage in asking your wife to go to counseling. I wish she would have agreed. Doris, I’m sorry but I cannot. While I think I have something to say to general questions about marriage, I am not a marriage counselor. I would be happy to refer you to one, even some that do Skype counseling. Has there been a decline in intimacy, sexual desire, response or number of encounters..
My husband and I have been married 40 yrs. Over our separation we agreed to full disclosure. So my husband has disclosedone that before we were married but living get together he had a one night stand. He says it happened one time overr 40 yrs ago. He says once he made his commitment to me that he never strayed again . I believe he is being honest aboutit. Although he says he does not remember the circumstances of how it all happened. He does remember feeling awful about it. We were young I was 17 he was 19 and we had a small child. I think the issues I’m facing are that I don’t feel like there is closure for me because he has very little memory of the act. He says he feels awful and we both still love and want to be together, he has agreed to counciling but I’m not sure that it would help with something that happened over 40 yrs ago. But I struggle with an image now in my head. We want to be together but we have this hanging over us now. 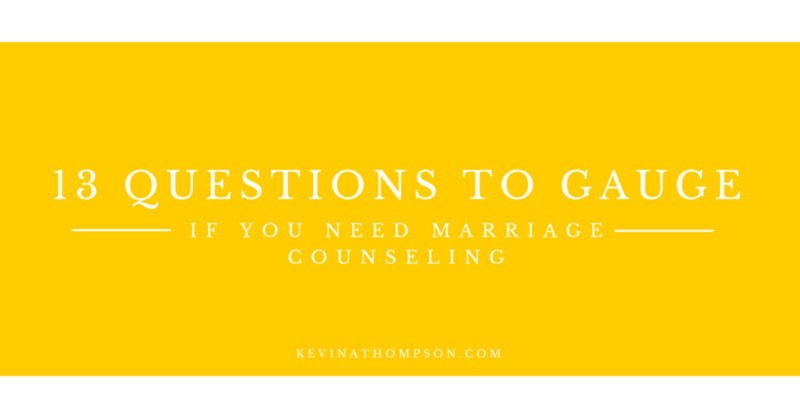 These are really good questions to find if you should go see a counselor about your marriage. Great job Kevin, thanks for sharing! Is having lust for your body strongly sometimes a sign that he may dosent love you?? Sometimes he behaves very differently..he takes me for granted..though we have a histry..like he once cheated on me..and i forgave him because he asked me..and promised he wouldnt do anything again like this..and i could see that hez changing..in a good way..but sometimes he takes me for granted..first of all my question is how do i find out if he loves me or not..?? Secondly i want this relationship yo work..thirdly i know i couldnt clearly potray my problems to you..but please hlp me from this overview..and yes i would like to say..his mother passed away when he was small..and now its been a month his father too expired..soo u can assume how lonely he is feeling now..i just dont want to leave him in this situation..i want to be beside him..hlp me please.. I was talking to my cousin the other day about her relationship with her husband. She and he have been struggling recently and have considered marriage counseling. As they are looking I will tell them to ask themselves some of these questions like thinking about other people. 14th question, Are you scared to get real with your spouse about the issues for fear that they will get upset? Physical? Or place all blame on you? My husband and I recently lost a son, and we have been wondering if we should go into relationship counseling. So thanks for mentioning that if a new stressor has come up, like grief or sickness, we should start looking into therapy. We will definitely start relationship counseling because of our recent loss and the fact that we have been growing apart. I’m sorry for your loss Ashley. I would highly encourage a counselor assisting the two of you through this process. Kevin, some of the questions I answered yes to. My wife and I know we love each other but I’m not sure how to handle certain situations or even how to come above it. I’m not well with sharing my feelings and I feel I’m the reason why this marriage is falling apart. Our arguments have now turned into physical fights and I’m afraid to lose this marriage but also running out of things to think about on how to keep it together, not that I had a lot of ways to try, I need a guide so I can try something possibly new? It’s time to get help. Call a counselor and commit to the work. Am blessed man of,God bless you!!!! I am glad you mentioned asking if you can feel unable to discuss your concerns and feelings with your spouse. My wife and I are looking into finding a counselor for us and our family. Thanks for the questions to see if you need a marriage counselor. Thanks for pointing out that talking to a professional can help if you feel like there is a problem in the relationship that is being ignored. I will suggest this to my husband so that we understand why we are fighting too often now compared to before. Our son is being affected by this already which is why his scores at school are going down.